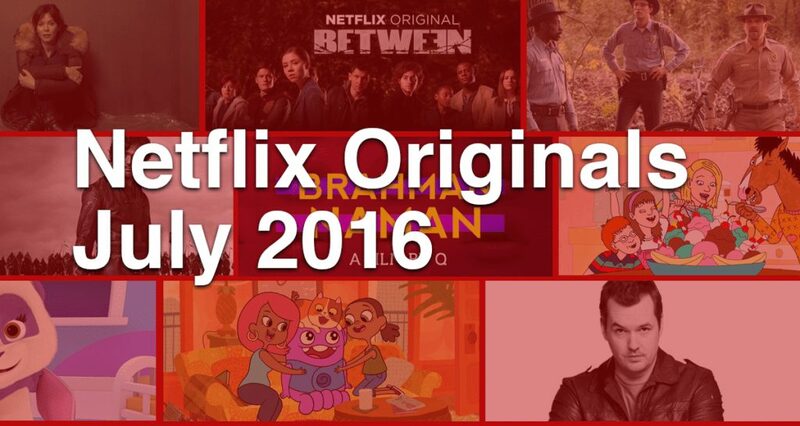 Welcome to your preview of all the new Netflix Originals heading our way in July 2016 and there is a heck of a lot of them. We’ve got the return of some beloved titles such as Bojack Horseman plus the long anticipated season 2 of Marco Polo. We’ll also see the returns of Canadian show Between and the debut of the critically acclaimed TV series Marcella too. In all, there’s 11 Netflix Originals heading our way in July 2016 which is up massively from previous months and hopefully a continuing trend. It seems like ages since we first got our hands on the first season of Between but believe it or not it’s only been a year since we got season 1 of the show. Once again, we’ll be getting new episodes of Between on a weekly basis after it has aired on the Canadian network which by the way, excludes it from being on Netflix CA. We’ll have the full release schedule soon but we expect to see 6 episodes again. Most of the cast is returning and with any luck, we’ll finally get some answers as to why the population continues to decrease. If British dramas are your thing then Marcella should definitely be on your radar for streaming on July 1st. Coming to every Netflix region with the exception of Netflix UK and IE, you can expect plenty of twists in the award. It comes from the creator of The Bridge and takes you on the journey of one police officers struggling career. It joins the likes of Peaky Blinders and Sherlock in the British lineup of Netflix Originals. Netflix’s heavy weight is back for a second season. It’s been a dry few years with only a Christmas special to keep us entertained after season 1 dropped. The big budget and supposed Game of Thrones killer hasn’t quite delivered on that promise yet but still has an interesting premise to continue building on. This will no doubt me most people’s summer binge. Netflix launched in India in January 2016 and Brahman Naman will be the first of the countries output in the Netflix Original library and will no doubt be the last. This movie has had a long tour of various movie festivals across the world and for the most part has racked up quite a good reputation. The comedy is a coming of age movie that is basically the Indian equivalent of the US’s American Pie and the UK’s Inbetweeners. Word Party marks the first Netflix Original series from the legendary studio called ‘The Jim Henson Company’. Like many of other of the other shows carrying the Jim Henson branding, it’ll focus predominantly on learning and will aim to improve children’s vocabulary, maybe I should give this a watch too? The series will feature 4 fluffy young animals as the tutors for your pre-schoolers. Bolstering the Netflix Original documentary lineup this month is a documentary on the self-help guru Tony Robbins. Having premiered at SXSW in 2016 the documentary movie will be premiering exclusively on Netflix on July 15th. It’s about the life of the Tony Robbins whose worked for over 3 decades producing books and seminars helping people. It gives never seen before behind the scenes at these massive events. Can we all just be honest here, Will Arnett has become somewhat of a poster boy for Netflix. He stars in the revival of Arrested Development exclusive to Netflix, Bojack Horseman and the recently released Flaked. Bojack is returning for its third season in three years with all the cast still in tact. It’ll once again explore Bojack’s continued disastrous life in the celebrity world. It’s among the several shows on Netflix that seriously looks into mental illness and does a great job of it. I can’t actually count how many Dreamworks TV series have now come to Netflix in recent years. The next to get the Netflix treatment is Home. While the movie didn’t exactly set the world on fire both failing critically and commercially. The TV series looks to reinvigorate the IP by giving it a new lease of life on Netflix. It’s 2D much like other Netflix Dreamwork titles and all episodes are landing on Netflix towards the end of the month. To round out the end of the month, we’re getting a Netflix Original movie that isn’t produced and starring Adam Sandler, yay! Instead it stars Ellen Page in a movie about a young mother who’s struggling to keep things afloat. It’s written by one of the staff writers at Orange is the New Black and has already been shown of at the Sundance film festival where it received rave reviews. Stick around on What’s on Netflix towards the end of the month for when the full list of titles get announced for July 2016. Among them, we already know that the 2015 movie The Big Short as well as the Back to the Future trilogy and Lethal Weapon.